Starting your day has never been easier. At 5350 Park, the possibilities are endless: take a dip in the pool, jog in the park, or drink a warm cup of coffee on your private balcony. Adding an adjacent studio residence to your floor plan allows you the flexibility to keep houseguests close, while still maintaining your personal space. We make everything a breeze, so you can relax more, do more and live more. With three acres of wide-open green spaces, walking trails, a playground and more across from home, Downtown Doral’s lush public park is designed as your urban oasis. The open-air pavilion features Micco, a monumental sculpture by world-renowned artist Michele Oka Doner. Fly a kite with your children, bike with your sweetheart or let your thoughts run freely. EXPLORE a new place to learn. Your child’s bright future is just across the street. Walk your little ones to a brand-new, state of the art charter school featuring small class sizes and highly experienced teachers. Downtown Doral Charter Elementary School is designed to provide a competitive education up to fifth grade, with a dual-language curriculum in English and your choice of Spanish or Portuguese. Boutiques, spa treatments and more are right here in your backyard. You’ll also find everything from the perfect cup of coffee to the freshest ceviche. Downtown Doral has the ideal mix of everyday needs like a dry cleaner and must-haves like a gelato shop that make it easy to leave the car at home and shop locally in the city. Where do you go when the sun goes down? Hang out with family and friends at your choice of Downtown Doral restaurants, where everything from fine dining to fun and casual dinners are always an option. Head down Main Street and have an authentic Asian dinner or take your taste buds on a journey through Spain. Looking for something outdoors? Bring your blanket, popcorn and favorite people for an outdoor movie screening at Downtown Doral Park. At 5350 Park, you can enjoy nights and weekends that are close to home, but far from boring. Keep your golf bag handy; one of the highest-ranked golf destinations in the world is just minutes from your door. Featuring beautiful lakes, palms and undulating greens, Trump National Doral Golf Club, home of the WGC-Cadillac Championship, offers lessons, a lighted driving range and four exciting courses: Red Tiger, Golden Palm, Silver Fox and the legendary Blue Monster. This changes everything. With a prime location near major highways and public transportation, living at 5350 Park cuts down your commute immensely. If your office is one of the major corporations or small businesses in Downtown Doral, getting to work is about to get short and blissfully easy. Very rarely is the perfect escape right outside your door. Just a few steps from this unique residential tower is a three-acre park invites you to reconnect with nature as well as your creative side. Expand your senses on lush grass and under the soaring monumental sculpture created by world renowned artist Michele Oka Doner. From the lobby to your living space, 5350 Park has been thoughtfully planned. Acclaimed designer Giorgio Ferrara has created a lobby that gracefully brings the outdoors into your home by using a color palette inspired by nature. Masterfully crafted to expand your possibilities, at 5350 Park you can expand your living space with the option to purchase an adjacent studio to your residence, complete with a private bath, kitchen and separate entry. Now you can breathe easy with the ideal solution for guests, a growing family or a personal office. The amenities at 5350 Park bring the resort life to your home. Relax on a canopied daybed by the pool, sip wine beneath pergolas draped by tropical flora, host a birthday party in the event room, or play to win on an oversized chessboard. Think of it as your personal wonderland. Go for a work out at your state of the art fitness facilities, indulge with a massage, or relax in the sauna facilities. 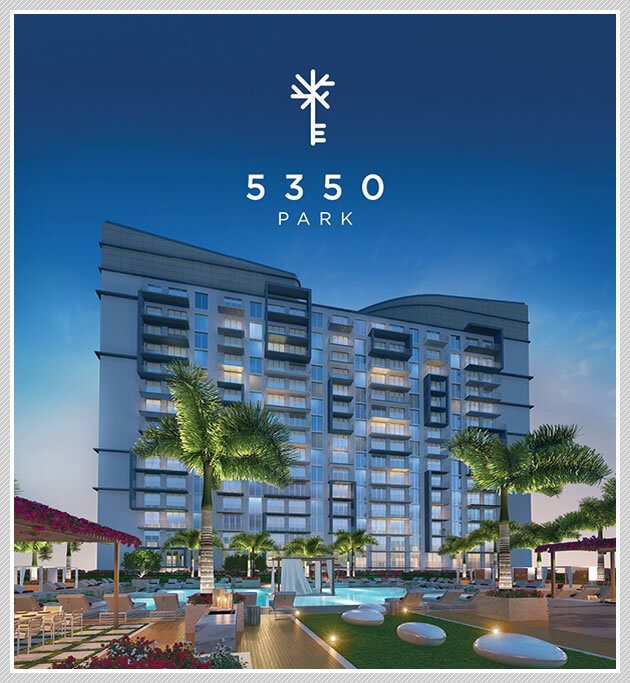 With all these luxuries and more, 5350 Park offers resort living at its best.